Up early as Ron is taking us to the airport. As we were heading down the gravel road his favorite song came on with one of his favorite sayings. "God is great, Beer is good and People are crazy". At the airport we got to watch the TSA personal unpack our bags to check for illegal items. The one man was quite excited when he found some boat glue that he deemed dangerous. He called out my name andI had to give it to an agent. The most fun of the morning was watching him try to repack my canoe barrel. I was not allowed to help and became a little nervous as he used the push on it with all your weight to get the lid closed method. Fortunately nothing was broken when we unpacked it. The plane was on time, the two Danes brought us coffee and hot chocolate and sent us on our way. As we left Kotzebue we were able to see the Noatak briefly as we quickly headed into the clouds and made our way back to Anchorage. Fairbanks was our final destination as our van was waiting for us there. We started up the van, loaded our gear and drove back to Palmer. This last month has been an amazing journey! The mosquitoes and biting gnats continued to hit our tent for most of the night and then they were gone. The tent started flapping as the wind picked up. Turning on the marine radio much to our dismay the weather forecast for crossing was looking dismal. We knew that we could make it to the mouth of the river, but crossing in our open boats was most likely not an option. We had hoped that perhaps our Danish friends had paddled in the night before, but as we neared the mouth of the river we saw their tent. We told them of the new weather forecast and that we were going to see if we could find a boat to come pick us up. We told them that it would be fine for them to join us. 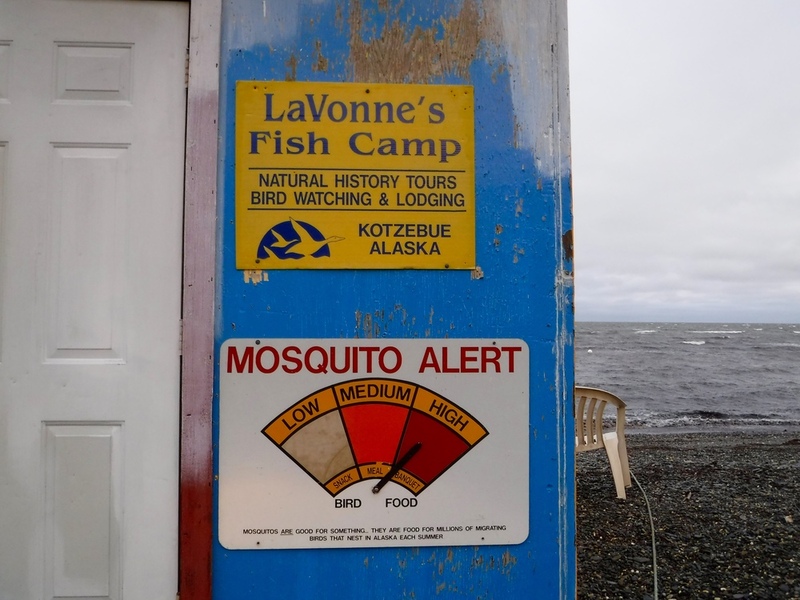 We called Lavon who is the owner of Lavon’s Fish Camp. She said call her back in an hour and she would try to find us a boat. She had success and Matt appeared within the hour. Crossing the Sound on very confused seas made us glad that we were aboard his boat. Ron from the fish camp met us at the dock. We loaded our gear in his truck, mailed our bear containers back to Bettles, changed our flight to leave tomorrow and then headed the three miles down the coast to the Fish Camp. Lavon and Gail were great hosts as they had prepared a great meal of lentil soup for us. We were able to dry our gear, make 6 bags at 50 pounds each and take warm showers. The wind continued to blow and the rain fell through out the night. We were glad to be on this side of the bay and in a warm cabin. If we did not know differently it would seem that we are on a lake. The surrounding scenery is anything but disappointing. 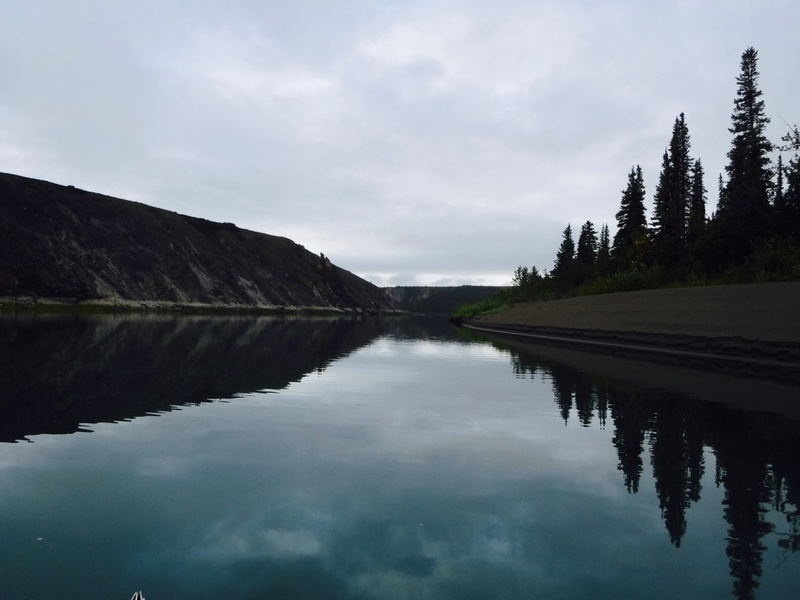 A lot of folks take out at Noatak, but we are glad to be paddling this part of the river. Thinking we might be done with bear encounters I was not happy when we saw a bear on the shore last night. Thankfully he stayed on his side. Our goal today was to make miles that would put us in good position for our paddle into Kotzebue tomorrow. The weather forecast sounds good and as the evening approaches the winds are calming. We find an island and observe the tidal line. It looks good and even though there are bear and moose tracks, we decide to stay. We bake up some bread and when we see the Danish men we invite them in. They quickly ate the pan of bread. We told them of the weather forecast and they said that they were going to go to the mouth and cross in the morning. The worst mosquitoes of the trip sent us to the tent early, but not before we watched as several rainbows appear in the sky. We are looking forward to our crossing of Kotzebue Sound. The night the bear came to visit. About 2:30AM the sea gulls started screeching. It was as if they were warning us of an unwanted visitor. Sure enough that is when we heard the bear walking right by the tent. We could hear the bear breathing. I unlatched the safety from the bear spray and wondered how our tent would fare against bear claws. I did not get to find out as the bear just walked on by. Don was soon back to snoring lightly and I was in my bear alert mode. A night of waking and sleeping was my operating mode. We are now in range of using the marine band radio for weather forecasts. The prediction of rain for today was accurate. We tried to gather rain from the tarp, but with little success. The river had some debris from the rain, but was adequate for cooking. The river has become quite wide and the current is noticeably slower. Even though we are still about 75 miles from the mouth of the river, we started seeing seals.They had come up river to eat the migrating salmon. Several groups were basking on the shore. We landed and were able to get close to them before they dove into the water. It is fun to see them use their periscope movement to observe us. We found a small stream and filled our droms with water for the next several days. A check for blueberries rewarded us with a bountiful supply. The terrain looked easy to walk on, but the tussocks proved otherwise. Not wanting to risk a turned ankle we took our berries and headed back to the boat. The wind is now our enemy as it feels like lake paddling. We are able to get some relief as we hug the shore when we can. More power boats are on the river as now we are only 50 miles from the mouth of the river. We find a large gravel island and settle in for the night. As the sun is setting we see the two Danish men approaching. We heard some running sounds in the middle of the night. We got up about 3 to take a look, but did not see anything. I held the bear spray for a while, but finally fell back to sleep. It is not a deep sleep as it seems like I have an ear open for the bears. After a somewhat restless night we got out of the tent around 8. That is when I saw the tracks that were made by the bear in the night. One could see where the bear had come to a sliding stop about 15 feet from our tent and then reversed his steps. We have never been around so many bears. It is awesome and frightening at the same time. A leisurely morning found us washing our hair and cleaning up our bodies. In the distance we saw the town of Noatak. We also meet two young men from Denmark who are also planning to paddle to Kotzebue. At one time the main river channel flowed next to the town. It now however is further away. Not a problem for paddlers and small boats as there is now a smaller channel that goes by the town. It is a problem for barges which no longer can bring fuel to the village. All fuel is flown in which makes it very expensive. We decide to by pass the town. Our old maps are not quite useful here as the river has cut many new channels. We try to follow the main channel, but sometimes find that we have chosen the wrong one. We come to a nice looking gravel bar and for once there is not a lot of bear tracks. We set up camp and make Pizza and rolls with the heat diffuser that a student of ours in Baja sent us. As we are enjoying our meal, we notice a large bear on the other side of a wide section of river. We think no worries why would he want to cross? Well, he did and not only did he cross, but began walking toward our camp. With whistles and bear spray in hand we slowly walk toward the bear. We let the bear know that we are here and it should go elsewhere. He does not seem to care and continues towards us. And then at the right moment for us, a motor boat comes up the river and off goes the bear. 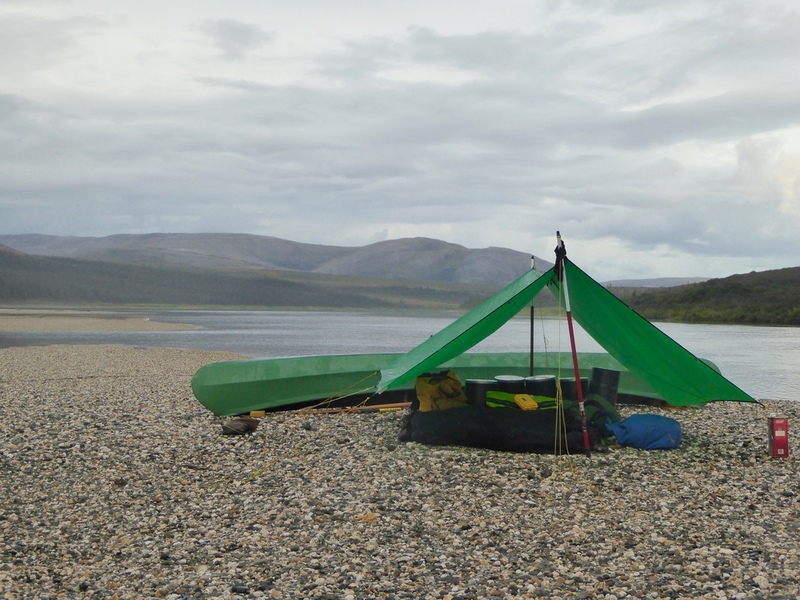 We put the canoe next to the tent and settle in for the night.